To the nation’s surprise – Nigel Farage lost his bid to become the elected Member of Parliament for the constituency of South Thanet in Kent. And the picture above reflects this collective disappointment – his disappointment. The UK Independence Party identified South Thanet as their flagship campaign… their SuperBowl – their ‘Hail Mary’. Why? Because it was the stomping ground for their single minded, charismatic and downright blunt leader – Mr Farage. However, this ‘unique selling point’ which is portrayed as UKIP’s ‘secret weapon’ has gone one step further – Mr Farage and his colleagues with differing ranges of loyalty are now accusing the Conservatives of “perverting the course of a democratic election”. Now don’t be fooled – UKIP’s crack team of electoral fraud investigators have not discovered these inaccuracies by themselves. No, this is the work of Channel 4 News and their Chief Political Correspondent Michael Crick who have uncovered imperfections in Conservative Party financial returning forms from the 2014 Newark, Clacton and Rochester by-elections plus the South Thanet General Election campaign. Now, I am in no way stating that these allegations are true, or indeed false, however I am sceptical – electoral expenditure is rigorously monitored and checked by the Electoral Commission who set the total election expenditure limit for a single candidate at £39,400 – encompassing both the ‘long’ and ‘short’ campaigns. Now, Mr Crick and his investigators claim: “had those sums been declared, the Conservatives would have spent up to three and a half times the legal spending limit.” Again, this may be true, however I do doubt that the current Conservative government has committed the largest election fraud in British history over the course of four separate elections. I cannot speak for the other three MP’s and their respective constituencies of: Newark, Clacton, Rochester and Strood – but I can guarantee in South Thanet… The UK Independence Party are simply attempting to exploit these allegations for their own political gain. On the 14th March 2016 Chris Adams, UKIP’s National Nominating Officer, sent a letter to The Director of Public Prosecutions – Alison Saunders urging her to investigate: “breaches of election law and possible conspiracy”. The UK Independence Party poured time, money and manpower into South Thanet – throughout the course of the election it was impossible to even walk down a street in: Ramsgate, Broadstairs or Sandwich without seeing some variation of UKIP promotion, whether that be: posters, billboards, banners or physical human campaigners. I have no tangible evidence to prove this, neither am I posing an allegation, however I would urge a review of UKIP’s own campaign finances, especially in South Thanet, given their rather ‘over the top’ election promotion campaign. Personally, I believe this allegations are: untrue, false and are based on inconclusive evidence which can be derived from simply reading the Conservative returning financial figures from an alternate angle, therefore interpreting facts to support your own conclusions. If any wrongdoing has occurred, of which I highly doubt – action will be taken. However, the allegations presented by Channel 4 News and Michael Crick are simply forming the basis for a UKIP political coup, especially in South Thanet. 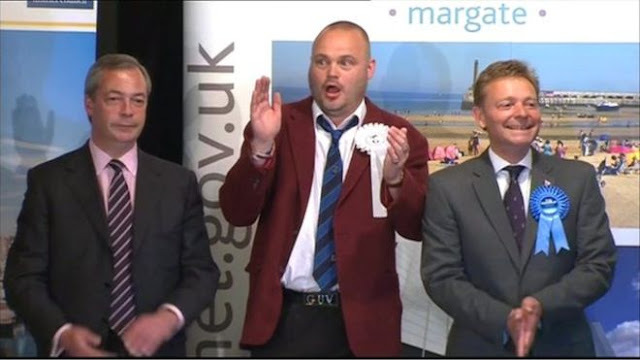 If any wrongdoing can be correctly or falsely proved, Craig Mackinlay MP and his electoral agent will be disqualified, and a by-election in South Thanet will ensue. The Conservatives, although it pains me to say it, would be unlikely to win given the damage UKIP would have inflicted upon them. You may ask: “do you have any evidence to prove UKIP are using this opportunity to sour proceedings?” Of sorts, yes I do – during one of Michael Crick’s most recent broadcasts on this matter he interviewed Mr Michael Barnbrook, a local South Thanet resident and former Metropolitan Police Inspector, who in the past has stood for the British National Party and UKIP themselves, and is currently pursuing Mr Crick and Channel 4’s allegations with Kent Police. Under election law, an appeal against electoral spending concerns cannot be made after a twelve month period has elapsed, however also by law, an extension can be sought from a Magistrate by the police to keep the investigation open for a further twelve months. Mr Barnbrook stated: “before the twelve month limit expires I shall write to the police and tell them that I am still waiting for a decision, and make them aware that they can go to a Magistrates Court and seek an extension of the time limit – to prevent them from saying after twelve months, unfortunately there is nothing we can do. If they don’t, I shall make a formal complaint against them.” However, aside from the fact that this is blatantly another UKIP agitation, Mr Barnbrook is a former police inspector and a former member of the BNP! Under what basis should a man with possible strong racial prejudices be commenting on this matter? Let alone, if put in front of a court, the first question asked by the defence would be: “Mr Barnbrook, are you a racist?” Bringing into question the ethics, ethos and professionalism of the Metropolitan Police. All we are seeing is the same repetitive, malignant and shrewd tactics that Nigel Farage is employing internally to disrupt his own operation – he ousted Suzanne Evans and is attempting to repeat the scenario, just with a: respectable, hardworking and honest MP instead of his former Deputy. The official appeals period is soon to elapse, and the sooner it does, the sooner we can relax – all these allegations are doing is providing UKIP with the possible basis to fight another election, after such a disastrous result in May 2015. If this is what Nigel Farage and his UK Independence Party have to do in order to gain electoral credibility – they are going the wrong way about it. Before a political party can win elections, it has to solve its own quarrels first… this I would recommend to UKIP.